Thank you for your interest in Arizona Taxidermy Training. Whether you are pursuing a lifestyle change, or are a sportsman or hobbyist wishing to enhance and supplement an already exciting sporting lifestyle, or maybe simply just looking for a new challenge – you’ve taken the appropriate first step. A Taxidermist is a Wildlife Artist who works in a 3-dimensional world creating specimens as close to the actual living animal as possible. Taxidermy has provided many people a wonderful and exciting personal opportunity. Starting a taxidermy studio is relatively inexpensive. Our courses are designed to provide you, the aspiring taxidermist, with the necessary professional education, knowledge, tools, and above all, the confidence in your own new-found taxidermist abilities, to meet the challenge of beginning your own venture in this exciting field of endeavor if you so choose. Because we fully understand the diversity of each student’s own particular wants and needs, we offer a variety of educational options / courses. First and foremost, YOU, the student, choose the specimens you’d like to mount and take home. We find that giving this freedom of choice to the student allows them to mount specimens that fit their own geographic region and their own personal fancy. Having to be forced into mounting specimens selected by someone else, and which may not even appeal to you in the first place, just does not seem to make good sense. 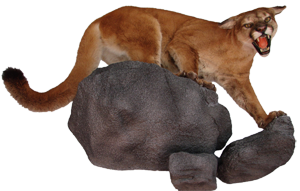 We feel that being able to mount your favorite animal or species keeps it exciting and rewarding for the student. At AZTT, you also have the option of choosing select courses encompassing 2, 4, or 6 weeks in length, or for those wishing a complete professional taxidermy education, we offer an in-depth comprehensive eight (8) week program. This is our most popular program, providing you professional taxidermy training in all aspects of taxidermy, beginning with “Birds”, and progressing through “Game Heads”, “Life-Size Mammals”, and finally “Fish”, both real and reproduction. Your taxidermy instruction will take place in climate controlled, air-conditioned / heated facility, which also houses an operating taxidermy studio. We spared no expense in making sure we have the most advanced equipment available, supplemented by instructors using the latest, most advanced taxidermy techniques.